In case you missed what may have been the biggest announcement from Apple to date (although we doubt you did), makers of the world’s most popular smartphone just one-, no two, no THREE–upped themselves with the introduction of iPhone 6 and iPhone 6 Plus, as well as the extraordinary and revolutionary Apple Watch. What does the internet have to say? Tech reviewers and fanatics (aka Apple Fanboys) alike around the world are all chiming in with reviews, opinions, and comparisons of Apple’s largest yet slimmest iPhones to date. 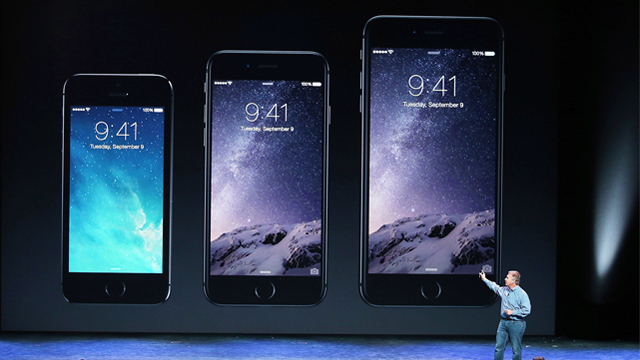 POPSUGAR breaks down the differences between the iPhone 5 and iPhone 6 & 6 Plus. Looks aside, they point to the new and improved processor, display, and battery life as reasons to ditch your old iPhone for the new iPhone 6. Or, maybe you’re just looking for a breakdown of ALL the new Apple products announced on Tuesday. Some are simply getting amped on iOS 8, and with new features for group texting, enhanced searching, and photo editing… the new operating system may be just as exciting as the iPhone 6. Those looking to switch to or from Android devices can see how the iPhone 6 Plus compares to Samsung’s world-renowned phablets. Yahoo takes a different perspective on Apple’s news by looking at what social media analytics say about Tuesday’s event. Were more people talking about iPhone 6, Apple Pay, or their first step into the smartwatch industry, Apple Watch? They’ve also got a pretty comprehensive look at all-things Apple Watch. If you’re looking to upgrade to iPhone 6 or iPhone 6 Plus, you may want to take a look at the new Apple Pay in action. Of course, you’ll always need a CandyShell Card on hand to carry around your I.D. and cash! In case you really missed the announcement, you can rewatch all of the videos that Apple played for its audience via TechCrunch. Or, head over to CNET to catch the must-see moments from Apple’s keynote. Okay, early adopters! Now that you’ve decided you want the new iPhone 6 or iPhone 6 Plus, just like all of us, so head right on over to MacRumors to find out when your next upgrade is. Set your alarm clocks for tomorrow and happy new iPhone shopping! We’re hard at work crafting mighty slim protection for iPhone 6 and iPhone 6 Plus. Stay tuned right here and sign up to be the first to hear when we have cases ready for Apple’s new devices.